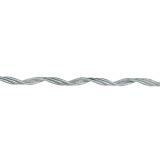 For joining High-Tensile (HT) wire to itself, or for splicing HT wire. No tools required; reusable if you don't get it right the first time. For connecting and/or splicing HT wire or woven wire. Removable (allows for mistakes or changes in connection patterns). Reusable. Almost impossible to install incorrectly. Provides a conductive, reliable joint or splice that's stronger than HT wire. Bring end of wire that is to be terminated to where it is touching the wire that it is to be terminated to. Starting in middle of TwistLink (a black dot marks the middle), lay end of terminating wire into the curl, holding TwistLink with your thumb and finger. Proceed to wrap remainder of wire into rest of the curls. Wrap other 1/2 of TwistLink onto the wire that you are terminating. Starting in middle, lay one end of wire into the curl of link. Wrap other half of the link onto other end of wire to be spliced. Repeat with a second TwistLink by laying another TwistLink into the open curls of the first one. 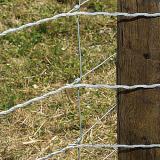 Use this tool to twist wire and terminate the fence line. 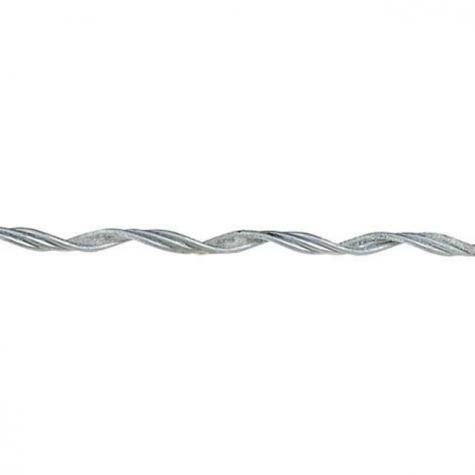 Can be used with high-tensile and woven wire. 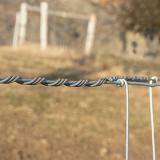 Great quality, easy to use, makes joining wire a lot easier for repairs or new fence construction. I have used every connector made. The twist links are by far the best. They hold, last, and can be temporarily disconnected if a correction or repair must be made. I cut these in half and used them as splices to join two non-HT wires that I'd previously twisted together. These are much stronger than the twisted wire alone. Love these! Easy to put on and take off. Simple to use.Convenient to have the option of using them permanently,or non-permanently.Nice to use without having to crimp.Nice to have the option of removing without tools.Haven't rusted in eleven years of use.